Known as America's last frontier, Alaska is also United State's largest state and is over twice the size of Texas. Alaska has always conjure an image of the grandest natural landscape and awe-inspiring sceneries. Her wild and rugged wilderness, glaciers, mountains, wildlife, and interesting people are Alaska's many offerings. The best and most popular way to see Alaska is from the coast, on board a cruise ship. Each year around 1 million people arrive to see Alaska on board a cruise ship and now I understand why. It is a fabulous way to see the coastline of Alaska, otherwise largely inaccessible. In June this year, we were lucky to get the chance to do an Alaska Cruise. For details of our we went about planning our trip and some tips, check out my other posts later on. After lots of planning and pondering, we decided to go with Princess cruises on their 7 days Voyage of the Glaciers cruise going Southbound (from Whittier to Vancouver). 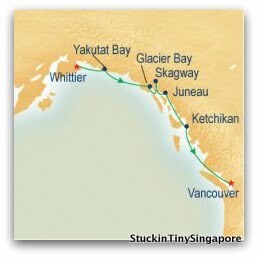 The itinerary took us from Whittier where we embarked to Hubbard Glacier, Glacier Bay National Park, Skagway, Juneau, Ketchikan and finally Vancouver. Princess cruise is one of the two cruise lines who can go into the Glacier Bay National Park, which was one of the reason we went with Princess cruises. Of the 7 days on the cruise, we have 3 port calls (Skagway, Juneau & Ketchikan) and 4 sea days which included one day at Hubbard Glacier, one day at Glacier Bay and 2 days at sea which included arrival day in Vancouver. So join us on our journey on this quintessential cruise and I hope you enjoy the posts. I think that if ever I would plan to enjoy an Alaska cruise, I'd do it during summer so that I could get to enjoy the chilly winds and great views which Alaska has to offer.